Walmart & FAACT Take The Fear Out of Halloween Fun! Walmart & FAACT Are Uniting Again this Halloween - Not Only in the U.S. but also in every Walmart in Canada! WEST CHESTER, OHIO - Did you spot #FAACTsTealGhost at your local Walmart? Be on the lookout this week and through the Halloween season! Walmart and Food Allergy and Anaphylaxis Connection Team (FAACT) offer Halloween treats that are filled with fun – not fear for children’s health. 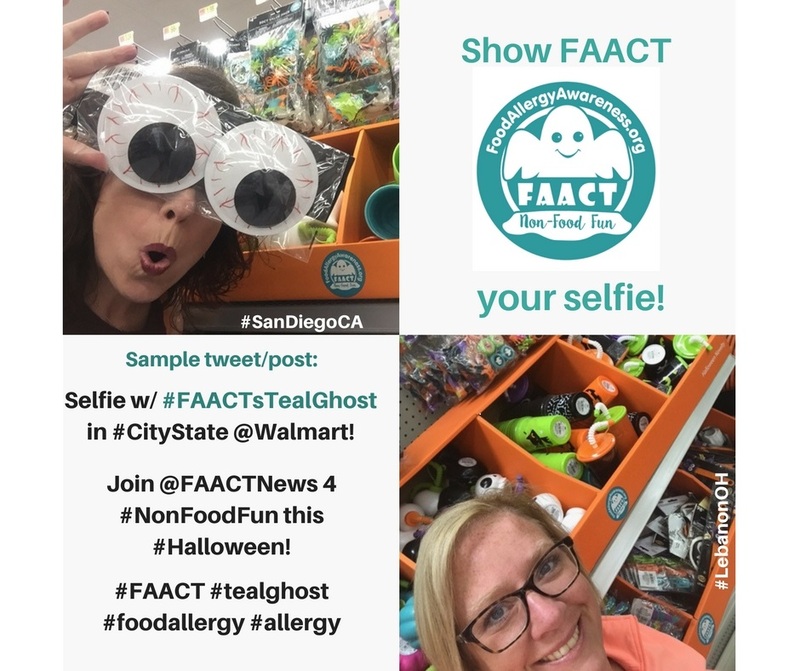 FAACT's Teal Ghost will be in every Walmart this season in the U.S. AND Canada! The scariest thing about Halloween for many families isn’t the costumes or decorations – it’s the possibility of a life-threatening allergic reaction to candy and other popular Halloween treats. And with growing concerns about childhood obesity and diabetes, we have even more reasons to make Halloween fun and healthy for every child. Walmart encourages families to “KnowTheFAACTs” about food allergies and consider non-food fun for school parties, neighborhood gatherings, and, of course, trick-or-treaters. From slime and stretchy eyeballs to headbands, bubbles, and bouncy balls, WalMart offers a fun array of non-food treats for Halloween…with FAACT’s Non-Food Fun Teal Ghost logo on display cases and packaging! Life-threatening food allergies affect as many as 15 million Americans, including almost 6 million children. That’s two students in every classroom across the country. The top foods that trigger allergic reactions include peanuts, tree nuts, and milk – all common ingredients in Halloween candies (or common to facilities that manufacture Halloween treats). There is no cure for food allergies. The only way to prevent an allergic reaction is to avoid trigger foods. Help us spread the word! Be sure to visit your local Walmart, and show FAACT your selfie! - IF you are in Canada, be sure to tag the @WalmartCanada Twitter handle. "Selfie with #FAACTsTealGhost in #CityState @Walmart! Join @FAACT for #NonFoodFun this #Halloween! Help us spread the word! Go take your selfie and share it with us! #FAACT #Walmart #tealghost #foodallergy #allergy #foodallergies #allergies #anaphylaxis #awareness #allergyawareness #KnowTheFAACTs #ShareTheFAACTs". - IF you are in Canada, be sure to tag WalmartCanada's Facebook page. Want to know another way to spread the word? Change your Facebook and Twitter profile photos to your #FAACTsTealGhost selfie photo and share with your family and friends! AND, share with your local news networks! Be sure to follow our daily Facebook posts and tweets for more Halloween graphics and tips to come! FAACT wishes you all an allergen-safe Halloween season! Thank you to Walmart for partnering with FAACT on raising awareness around Non-Food Fun! FAACT's mission is to educate, advocate, and raise awareness for all individuals and families affected by food allergies and life-threatening anaphylaxis. FAACT is also your voice for food allergy awareness, from keeping children safe at school to dealing with workplace issues or simply taking the family out for a bite to eat. Managing a food allergy on a daily basis involves constant vigilance. FAACT is here to support you in managing your food allergies – today, tomorrow, and into the future. For more information, please visit us at http://www.FoodAllergyAwareness.org or call (815) 276-3015, and follow us on Facebook, Twitter, LinkedIn, Instagram, and YouTube.